So, we've all seen this horror classic hundreds of times. What can you possibly say about it at this point? Thanks to the cool dementoids at London, Ontario's Vagrancy Films, I got to see it again on the big screen recently in all it's celluloid glory. Well, the first thing is it really is a lot scarier on the big screen with that pounding mono soundtrack. 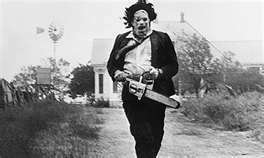 I've known quite a few people who felt a bit let down when they first saw Texas Chainsaw. That title and that opening credits crawl make you think it will be the most gruesome thing you've ever seen and really the only bit of serious gore, arguably, is the chainsaw connecting with Leatherface leg at the end. It's totally different on the big screen, though, where the filmmakers are totally assaulting your senses for most of the running time. They really pulled out all the stops with this one. It's also a bit like a fairy tale. The children shouldn't have wandered into that old house in the woods where the witches live and eat children. The girl has to fight to escape from them after they have her over for dinner and try to eat her. It's also a bit like a found document- the cinema vérité look has been imitated dozens of times, but there really are scenes here that look purely accidental or totally off-kilter, while adding to the tone of the film. The scene with the empty lake is unnerving for no apparent reason, but it just builds to one of the best murder scenes outside of Psycho. And note the subtle current of eroticism that only adds to the tension before the climactic murder. Nope. 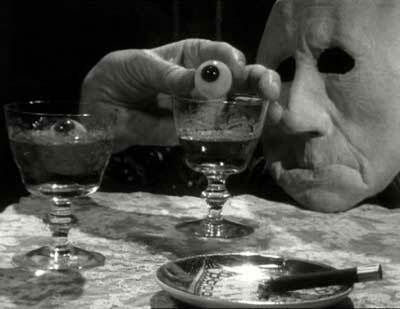 It's from "Hour of the Wolf"
Visually, TCM reminds me a bit of Ingmar Bergman's Hour of the Wolf, another horror film about a dinner banquet at a menacing house back in the woods. Bergman was fairly popular with this generation of horror filmmakers and was, in my opinion, the greatest horror director ever not to be recognized as one. Check out the scene in Hour where Max Von Sydow goes running through the fairy tale horror woods and compare it to the expert chase scene in TCM. At the least, the two movies would make an interesting double feature. Everything about TCM is expert though. For Tobe Hooper, this movie must have been a mixed blessing because it was his first hit and wound up being an iconic horror classic. It's a damn near perfect film too. Even the crippled brother Francis, who is annoying as hell, works in this movie because he's just another element in gradually ramping up the tension throughout the film. There's nothing reassuring or comforting in TCM; it's like a vice that slowly tightens on the viewer. You can watch the movie several times without catching its skewed sense of humor. Has there ever been a better ending to a horror film than the iconic chainsaw dance in TCM? It's one the purest expressions of madness on film and a pique so fevered the film can go nowhere but to black. 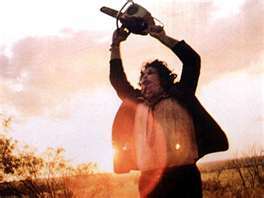 For Tobe Hooper, though, the problem is you can only go down from Texas Chainsaw Massacre. He's made some surprisingly great movies, with my second favorite probably being Eaten Alive, and there's a sort of visual continuity to all of them- he has plenty of shots of people running through the underbrush and disorientingly bright lights, for example. Many of his movies play like demented fairy tales. He's also particularly adept at filming madness and mania. Yet, he doesn't really seem to get the accolades that other genre filmmakers have. Maybe it's time for a serious reexamination of his body of work. But end with Texas Chainsaw Massacre. It's as self-assured a film as you're ever going to see, and if you see it on the big screen with a hushed audience, one of the scariest.